Hello! Is there anybody out there? I know, a silly question, of course, you are out there, or at least I hope you are! Otherwise, I am just writing this for myself, which would be kind of sad. But compared to last fall when it seemed like everyone I knew, many who had never invested in anything in their life were jumping into cryptos it does seem kind of lonely now. It seems that as time goes on and crypto prices drift lower and lower the excitement and all of the hype from last fall that peaked in December along with the price of bitcoin is nothing but a distant memory. As I am sure you know, the crypto markets have been stuck in a deepening bear market for over seven months now. There have been a couple of surges higher which helped energize the crypto community with the hope that we were on our way to new all-time highs, but they didn’t last. Over the last two months, we haven’t seen too much more than small bounces higher followed by big drops lower, this type of price action can be very depressing. These are the times that really test the beliefs and commitment of crypto enthusiasts/investors, this is the crypto winter! Unfortunately, I believe it is going to get even worse before we see any kind of sustained recovery and hopefully a new bull market. 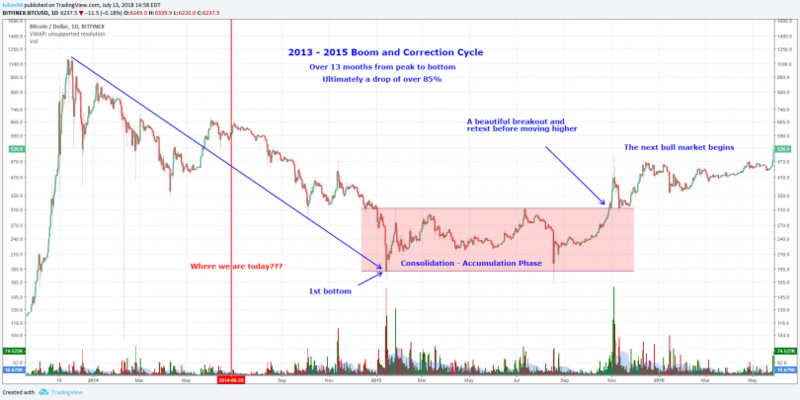 If we look back at the bitcoin boom and correction cycle which lasted from 2013 to almost the end of 2015, it can give us an idea of how long these cycles can last. That does not mean that this cycle will be exactly the same and take almost two years, but it very well could and we need to be prepared for that. Look at the chart below and imagine what the investors must have been feeling during the summer of 2014, chances are they were having a lot of the same feelings that we are feeling now. The vertical red line on the chart is a representation of where we possibly could be in this current cycle, there is nothing scientific about where I placed the line it is just based on how much time has passed since the peak of the current cycle. I think it is important to look to the right of the red vertical line and acknowledge that the possibility exists that it may be quite some time before we see the next bull market. I think it is very important to be realistic if instead we get excited everytime the crypto markets bounce higher thinking that it is the start of another bull market only to be disappointed again and again, after a while it is going to burn you out. My opinion is that the crypto markets are first going to have to find a bottom (if we are not already there) and then enter a consolidation – accumulation phase similar to what you see on the chart below. So my point is that I believe we are many months away from the next bull market. Just as a side note, I find it kind of ironic that both of the cycle peaks, 2013 and 2017 both occurred in December, it most likely is just a coincidence but I find it interesting. So how do we survive this crypto winter? My advice and this is what I do is to think long-term, try to ignore the day to day price movements. I mostly invest in coins & tokens that I really believe have a practical purpose and that I believe will be around for years to come. In my opinion, this is very important, because the more passionate you are about something the more likely you are to stick with it. Now having said that, a prolonged bear market will cause almost everyone to have second thoughts about how and where their money is invested. This is the time to hold strong though if you really believe in your investments. If you really believe in what you are invested in and plan to hold them long-term (years) as I do then it would be very wise to ignore the markets as best you can. I am not saying to totally forget about your investments but maybe only check on them every few weeks or once a month. When checking on them always remind yourself that these are long-term holdings, I look at them as a kind of crypto 401k plan. It is also very important to not be over-invested, even though I remain very bullish on cryptocurrencies they are still very speculative. You will know if you have too much of your money invested in cryptos if you constantly watch the markets and if you worry about them too much, especially if you wake up at night worrying about them. Lastly, I would say to be realistic about how long this whole cycle may take to evolve into the next bull market. Study past boom and correction cycles, not just in cryptocurrencies but in other assets also. I think that you will find that in a vast majority of cases it is a very long-term process, rarely do they reverse to new all-time highs in a short period of time. In my opinion, it is far better to prepare yourself for a very slow recovery and then be pleasantly surprised if it happens sooner rather than expect a speedy recovery and be constantly disappointed when prices move sideways or keep on dropping. So to summarize invest in what you really believe in, think long-term, do not watch prices too closely, do not over-invest, and be realistic about how long this whole process may take before the next bull market. I hope you enjoyed this article and thank you for taking the time to read it. So until the next one, take care and stay strong! It is still a work in process so keep checking back in as I will be adding a lot more merchandise. I will be using any proceeds from the store to offset the costs of materials and advertising related to my blogging, my website, my Patreon page, my YouTube channel and my steemit page.